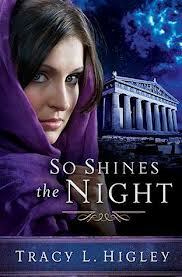 So Shines the Night is a fictitious rendition of Acts 18-19, and Tracy Higley does an excellent job of making these Scriptures come to life. The central character is female teacher, Daria, who escapes Rhodes by agreeing to become a tutor to Ephesian merchant, Lucas Christopoulos. But living in Ephesus is not what she imagined. She soon discovers that Lucas is involved with some dark and mysterious people. As Daria begins to uncover the mystery of her attractive employer’s strange activities, her path merges with both the local sorcerers and the followers of the Way, including the Apostle Paul, Timothy, Priscilla, Aquila, and other familiar biblical characters. This story rightly portrays the strong spiritual battle that was particularly visible during this period as expressed in the book of Acts, including many depictions of sorcery. While the descriptions of sorcery are carefully written so that they are “just enough” to set the scene, readers who have trouble with this subject matter should probably not read the book. Having had a background in the occult pre-salvation, I did have to take a couple breaks while reading–not because the book was overly dark, but simply because certain scenes reminded me of difficult parts of my past. That said, I really enjoyed the historical element of book, the romance, the mystery, and the beautiful way in which Higley renders her characters. The biblical characters were not as I personally imagine them, but I found it beneficial to consider them from a contrary perspective. Also, the story was actually inspired by the Temple of Artemis (Higley has written multiple novels now that set the scene around one of the seven wonders of the ancient world), and her thorough study of history shows in her writing. I have read two of her novels now, and have enjoyed them both.